The Beatles are still big in Mexico City. 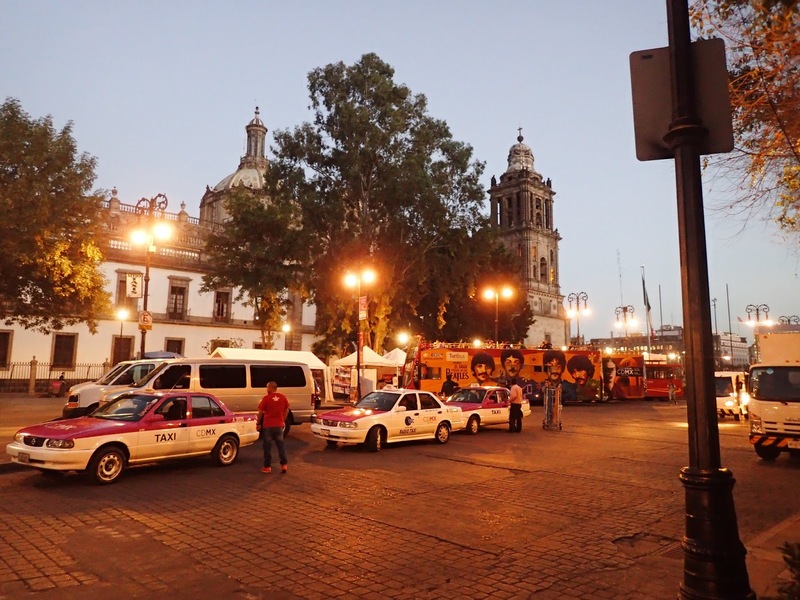 My trip from Las Vegas to Mexico City was filled with ups and downs. Getting up at 4 am is never fun, but its not so bad when you're filled with anticipation of a new adventure. Plus, we expected to have little to no traffic to and at the airport. The drive wasn't at all bad, but I have no idea why the airport was so freaking crowded at 5:45 on a Wednesday morning. It was still dark out. But American Airlines was very near the front of the departures area, so I was able to just jump out and get going. Huge thanks to Martha for giving me a ride at such an inconvenient hour. A very pleasant surprise awaited me at security, as the agent pointed out to me that I had TSA Pre-check on my boarding pass. It never occurred to me to check for that status, since I didn't realize that airlines could issue it to passengers. That was a heavenly experience. I didn't have to take off my boots, sweater and scarf. Nor did I have to remove my laptop or liquids. I just walked up to the conveyor belt, put my bags on it, then walked through the metal detector. Before my European trip in 2015, I had started apply for Global Entry, which is much the same, only even more convenient for international travel. But I didn't think I'd qualify. I don't remember the details, but I believe it had something to do with my having moved around so much for so many years. My plane from Las Vegas left late, which was a little worrisome, because my connection in Los Angeles wasn't very long. But when I got off in LA, I literally walked one gate over and immediately boarded my next flight. The flight from Vegas to LA, of course, is fairly short. The flight from LA to Mexico City was about 4 hours, but I watched the movie Arrival, and the time flew by. 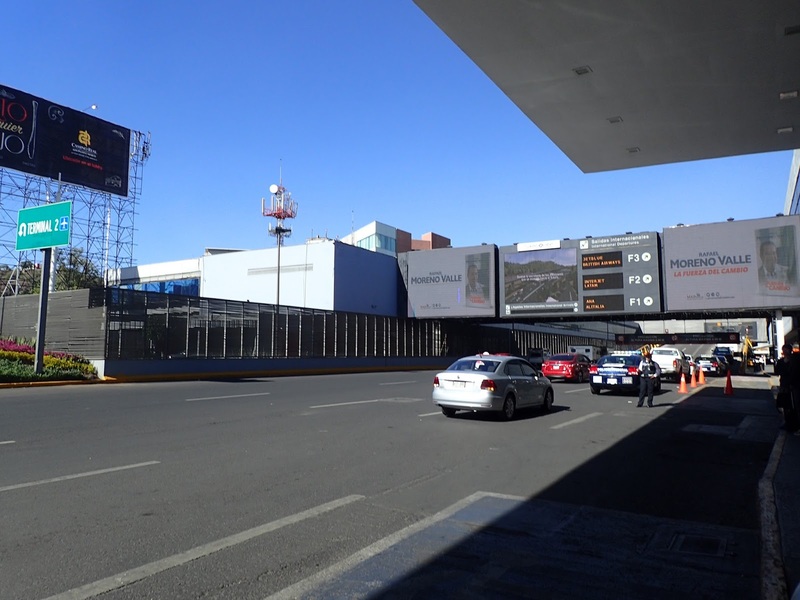 I landed in Mexico City in early afternoon to beautiful weather. 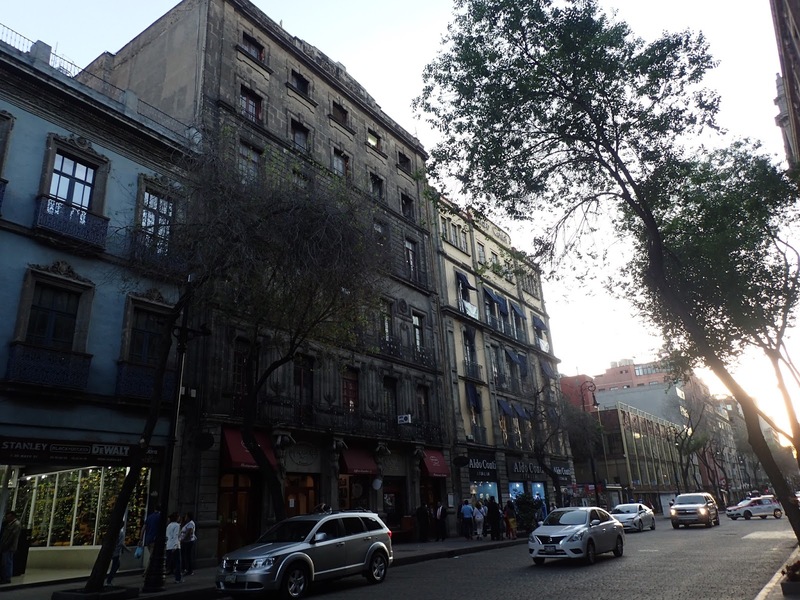 I had planned so well for my first couple of days, because I had never been to Mexico City before, and I have very little Spanish. That turned out not to be a problem. There always seems to be someone nearby who can speak English. Which is not to say I didn't have problems. In fact, I seemed to have nothing but problems as soon as I left customs. service. This is the complete opposite of when I went abroad for several months in 2015. That time, I unlocked everyone's phones and got SIM cards from 3 UK that we could use in almost all the countries we visited. And I kept my U.S. number to use when I got back. This time, I closed the account with AT&T that I've had for pretty much as long as I've had cell phones. And I didn't even bring a phone with me, just my iPad mini. I downloaded offline maps, which is what I mainly wanted cell service for when traveling. I also brought my camera, which is the other thing I most used my phone for. I won't be able to immediately post photos to Twitter or Instagram, or randomly check my email/social media from anywhere. But I think that will be a good thing. I will be experiencing my new surroundings without distractions except for specific times and places. I can still talk and text in any number of ways, as long as I have wifi, and I didn't plan to spend a lot of time away from places which had wifi. Unfortunately, Mexico City's airport does not have wifi. So when my debit card wasn't working at any of the ATMs I tried, there was no way I could call the bank to find out what the hell was going on. I have to admit, that gave me a moment of panic. But then I realized that I could just take the bus to my lodging and use the wifi there to call my bank. Until I got to the ticket machine for the metrobus and found out it only took cash. So there I was, stuck at the airport, with no way to get cash, call my bank or buy a bus ticket. I didn't even have U.S. dollars on me that I could have exchanged for cash to buy a bus ticket. Again, a moment of panic. Then I remembered that a taxi into the city center is less than $10. So I started walking back toward the authorized taxi desks, when I spotted an ATM that I didn't think I'd tried yet. Lo and behold, it was kind enough to start spitting pesos at me. By now, I'd been walking up and down the airport for over half an hour. So I went right back to the metrobus machine and got my new card with plenty of credit to ride back and forth from the airport, plus get around town a bit. But there were no signs for where to catch the bus. And I knew it was going to be at least a 30 minute ride, so I thought I should use the bathroom first. I spent another half hour looking for the bathroom and the bus stop. The bathroom was hidden down a curved corridor with no signs on the main walkway to show where they are. You had to look down the hallway to see them. There were also no signs for the bus stop, I had to ask someone. Finally, I was on my way into town. There was still plenty of daylight left, but my plans were completely shot to hell. 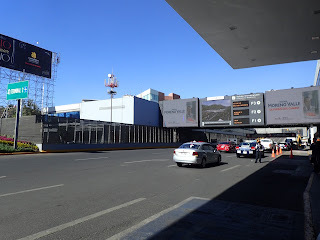 I had envisioned walking off the plane with my two little carry on bags, grabbing pesos from an ATM and a metrobus card, checking in just to dump my bags, then go out to eat and see a movie. 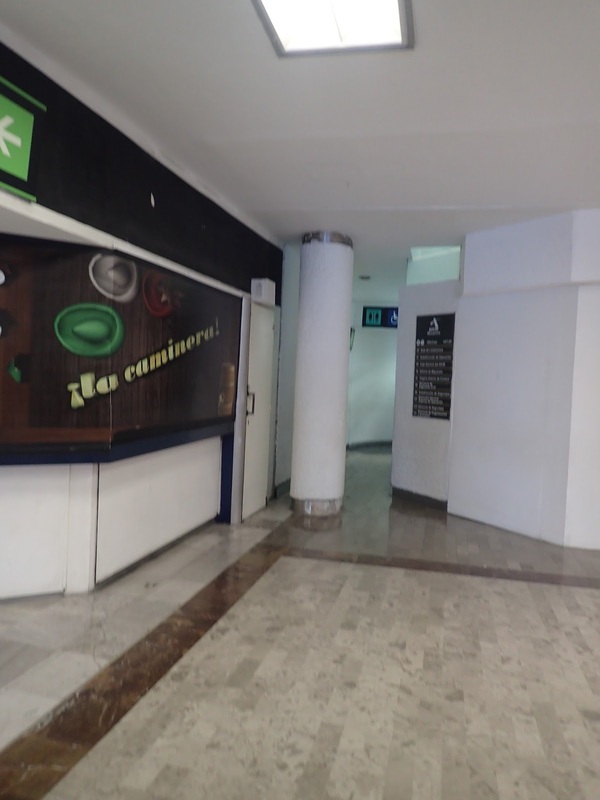 I checked in, then walked up three flights of stairs to dump the bags I'd been hauling around the Mexico City airport. Thank God I'd decided to pack extra light, just my underseat suitcase and a not very big backpack. 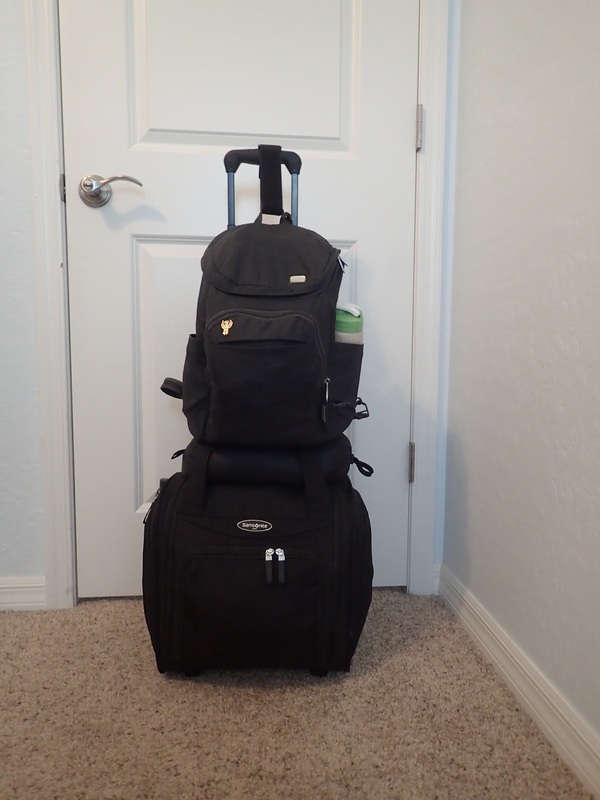 The suitcase weighs 9.75 kilos, and the backpack 5 kilos, which is about 32.5 pounds between the two. In all of my planning, I'd forgotten to check if Mexico counts floors like Americans or Europeans. I didn't remember until the receptionist told me I'd be on the third floor...which I now know is like a 4th floor walkup. 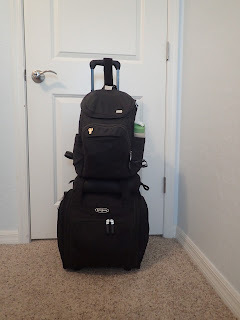 But this is why I wanted to pack in two small bags. I like staying in old buildings, and I don't want to have to worry about whether they have elevators or not. Anyway, it was almost 5 pm at this point and the movie was at 6. I could conceivably have grabbed a street taco and dashed over to the cinema that was a 20 minute walk away, but I was exhausted. Waking up at 4 am, then all the ups and downs, had sapped all my energy. 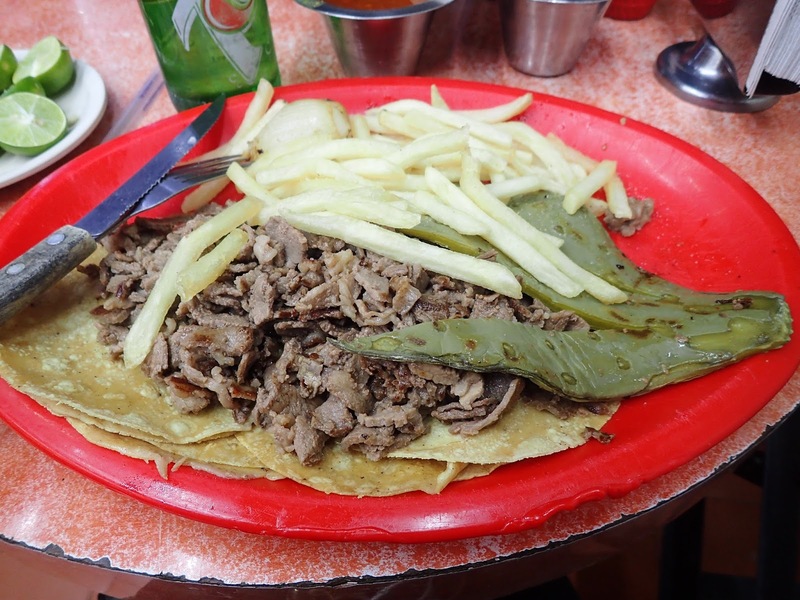 I walked a few blocks and got a filling plate of beef tacos that were nothing like what I imagined. A pile of soft taco shells topped with bland shredded beef was not helped much by the green pepper and onion added on the plate. The sauces, which did not make it into the photo, helped a bit. But nothing could do much for those pale sticks passing for french fries. The only saving grace was that the whole thing plus a soda only cost about $3.50, and there was a lot of it. But I need to start checking reviews. The soft serve ice cream cone I got after dinner was not huge, but it was still a very nicely sized dessert for about 40 cents. I got to see a little bit of the area, which was weirdly reminding me of New Orleans in certain places. Today, that feeling was even stronger, and I realized that it was actually reminding me of New Orleans from when I was a kid, before it got all prettied up. There were men walking around in short sleeved white shirts with ties, others in suits getting their shoes shined on street corners. 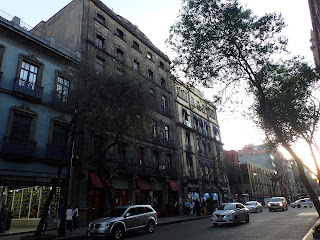 Parts of Mexico City make me feel like I'm caught in a time warp, and I'm not talking about the historic center. My second day is going a little bit better. I enjoyed the breakfast that is included in the price of my room. Scrambled eggs with green peppers, fresh toast with butter and jam, fruit, coffee are all good. There is a big jug that dispenses both hot and cold filtered water, so I can fill both my water bottle and my tea mug. However, I am not having any success so far finding a grocery store. My offline map gives me plenty of listings, but they are all turning out to be other types of retail establishments. Still, I'm pretty sure I can sort that out before too long. 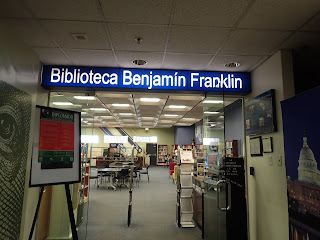 I did manage to find the Benjamin Franklin Library, which has fast wifi and outlets for my devices, so that I have a good place to work while I'm here. I understand that it's not far from the American Embassy, and I wonder if it is associated with the embassy in some way. There are two nice security guards in front, and a metal detector to walk through. Neither spoke any English, but they brought someone from inside who had more than enough to help me. Although when she asked if I had any guns in my bags, I had to laugh. She thought she'd gotten the word wrong, but I told her no, I had no guns or any other weapons. It's about a 40 minute walk from where I'm staying. Or, at least, it's a 40 minute walk if you don't stop halfway over to buy 4 big churros for about a dollar. But when they give you an extra churro because the wait is so long, it's kind of hard to resist stopping. I'm going to have to either take a different route or treat that place like I did Cafe du Monde when I was living in the French Quarter, and just not bring any cash with me when I go to the library. Oh, and it turns out that the cinema where I thought the English language movies were available was not the right one, after all. So I would not have gotten to see the movie my first night even if all had gone according to plan. The right theater is actually located just a few blocks from the library. So I can reward myself with a movie after putting in a bit of work. Tomorrow I'll nail down a grocery store, and then I should be set. But this is why I'm going with slower travel now. A stressful travel experience carries a lot more weight when you are in a location for only a few days. I'm going to be here for at least a week, possibly three or more, so that stressful hour yesterday which seemed to last forever will be barely a blip on my time in Mexico City.